Shares in WPP fell almost 11% after the advertising giant reported slowing sales and warned about future growth. The company said that group performance had been "much tougher" for the first seven months of its financial year. It blamed growing economic uncertainty, reflecting a "rise of populism" in the UK and the US, and "bumpy" growth in Brazil, Russia and China. WPP now expected sales growth to be between 0% and 1%, compared with previous forecasts of 2%. The reduced forecast puts WPP on course for its worse year since 2009 when like-for-like sales fell by 8.1% during the global recession. Shares in the world's largest advertising group fell as much as 13% on Wednesday before ending the day 10.9% lower at £14.20. Total revenue rose to £7.4bn for the six months to June, up from £6.5bn, while pre-tax profit jumped by 52% to £779.2m. However, WPP said that like-for-like revenue fell over the six months to June, particularly in the second quarter when spending by consumer goods firms was "under considerable pressure". 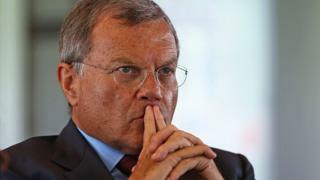 Chief executive Sir Martin Sorrell said such companies account for a third of WPP's business. Unilever, one big WPP client, announced earlier this year that it would cut its marketing spend. WPP's Ogilvy & Mather agency makes adverts for Unilever's Dove brand. Conditions worsened in July when like-for-like revenue shrank by 4.1%. The company said that like-for-like sales are down 0.9% for the year to date. Sir Martin said that there had been a "trifecta" of pressures on the business, with "digital disruption" forcing companies to change their business models and reach customers in different ways. Activist shareholders, fuelled by cheaper money, were also pushing businesses to cut costs, while some were practising "zero-based budgeting", starting with a blank balance sheet and ensuring all expenses are justified. WPP said that new business wins and increased client spending should help turnover in the second half of its financial year as well as into 2018, buoyed by events such as the Russian World Cup, the mid-term Congressional elections and the PyeongChang Winter Olympics. However, the company also indicated that uncertainty would continue next year because of economic and political worries in the US. Sir Martin told BBC Radio 4's Today programme: "Like it or not, the Trump administration has been much more open to business than the Obama administration, certainly in terms of connection." But he added: "That hasn't translated into significant policy change for a number of reasons." WPP said in its stock market statement: "The limitations of the new [Trump] administration seem to be jeopardising the anti-regulatory, infrastructure and tax reduction programme that was promised." But it added: "America First, if the new administration's plans are finally implemented, will almost definitely mean a stronger American economy, at least in the short-to medium-term."